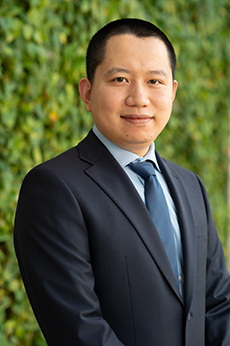 Dr. Luyao Lu’s Advanced Bio-integrated Electronics Lab explores the next-generation soft, lightweight, and bio-compatible materials and devices with an emphasis on creating inorganic and organic classes of optoelectronic systems. The goal is to provide advanced healthcare platforms that can seamlessly integrate with biological systems to facilitate personalized medicine design and accurate disease diagnosis. Current research projects include: 1) multifunctional soft optoelectronic systems for simultaneous optical/electrical stimulation and recording of cell activity. In this project, his lab will design high performance LEDs, photodetectors, and electrodes to detect changes in fluorescence and electrical signals, and explore different integration and encapsulation strategies to fabricate chronic operating multimodal systems; 2) high-performance wireless power supplies for various biomedical devices with a long-term goal of developing self-powering systems by integrating energy harvesting devices with batteries or supercapacitors. Luyao Lu†, Philipp Gutruf†, Li Xia†, Dionnet L. Bhatti†, Xinying Wang, Abraham Vazquez-Guardado, Xin Ning, Xinru Shen, Tian Sang, Rongxue Ma, Grace Pakeltis, Gabriel Sobczak, Hao Zhang, Dong-oh Seo, Mantian Xue, Lan Yin, Debashis Chanda, Xing Sheng, Michael R. Bruchas, John A. Rogers, “Wireless optoelectronic photometers for monitoring neuronal dynamics in the deep brain”, Proceedings of the National Academy of Sciences USA (PNAS), 2018, 115, E1374-E1383. Luyao Lu†, Zijian Yang†, Kathleen Meacham, Caroline Cvetkovic, Elise A Corbin, Abraham Vázquez-Guardado, Mantian Xue, Lan Yin, Javaneh Boroumand, Grace Pakeltis, Tian Sang, Ki Jun Yu, Debashis Chanda, Rashid Bashir, Robert W. Gereau, IV, Xing Sheng, John A. Rogers, “Biodegradable monocrystalline silicon photovoltaic microcells as power supplies for transient biomedical implants”, Advanced Energy Materials, 2018, 8, 1703035. Haoran Fu†, Kewang Nan†, Wubin Bai, Wen Huang, Ke Bai, Luyao Lu, Chaoqun Zhou, Yunpeng Liu, Fei Liu, Juntong Wang, Mengdi Han, Zheng Yan, Haiwen Luan, Yijie Zhang, Yutong Zhang, Jianing Zhao, Xu Cheng, Moyang Li, Jung Woo Lee, Yuan Liu, Daining Fang, Xiuling Li, Yonggang Huang, Yihui Zhang, John A. Rogers, “Morphable 3D mesostructures and microelectronic devices by multistable buckling mechanics”, Nature Materials, 2018, 17, 268-276. Luyao Lu, Tianyue Zheng, Qinghe Wu, Alexander M Schneider, Donglin Zhao, Luping Yu, “Recent advances in bulk heterojunction polymer solar cells”, Chemical Reviews, 2015, 115, 12666-12731. Luyao Lu, Allison Kelly, Wei You, Luping Yu, “Status and prospects for ternary organic photovoltaics”, Nature Photonics, 2015, 9, 491-500. Luyao Lu, Wei Chen, Tao Xu, Luping Yu, “High performance ternary blend polymer solar cells involving both energy transfer and hole relay processes”, Nature Communications, 2015, 6, 7327. Luyao Lu†, Tianyue Zheng†, Tao Xu, Donglin Zhao, Luping Yu, “Mechanistic studies of effect of dispersity on the photovoltaic performance of PTB7 polymer solar cells”, Chemistry of Materials, 2015, 27, 537-543. Alexander M Schneider†, Luyao Lu†, Eric Manley, Tianyue Zheng, Tao Xu, Tobin J. Marks, Lin X. Chen, Luping Yu, “Wide bandgap OPV polymers based on pyridinonedithiophene unit with efficiency >5%”, Chemical Science, 2015, 6, 4860-4866. In Hwan Jung†, Donglin Zhao†, Jaeyoung Jang, Wei Chen, Erik S. Landry, Luyao Lu, Dmitri V. Talapin, Luping Yu, “Development and structure/property relationship of new electron accepting polymers based on thieno[2',3':4,5]pyrido [2,3-g]thieno[3,2-c]quinoline-4,10-dione for all-polymer solar cells”, Chemistry of Materials, 2015, 27, 5941-5948. Reviewer for Nature Communication; Advanced Materials; Advanced Energy Materials; Advanced Functional Materials; Advanced Materials Interfaces; Chemical Communications; Journal of Polymer Science, Part A: Polymer Chemistry; Polymer Chemistry; Journal of Materials Chemistry A; CrystEngComm; Solar Energy Materials & Solar Cells; Organic Electronics; Dyes and Pigments; IEEE Journal of Photovoltaics; RSC Advances.